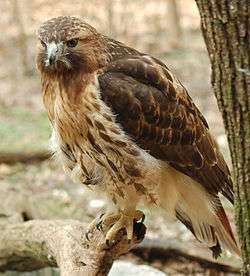 The Accipitriformes are an order that includes most of the diurnal birds of prey: hawks, eagles, vultures, and many others, about 225 species in all. For a long time, the majority view has been to include them with the falcons in the Falconiformes, but many authorities have recognized a separate Accipitriformes. As of 2008, a recent DNA study indicated that falcons are not closely related to the Accipitriformes, being instead related to parrots and passerines. Since then, the split and the placement of the falcons next to the parrots in taxonomic order has been adopted by the American Ornithologists' Union's South American Classification Committee (SACC), its North American Classification Committee (NACC), and the International Ornithological Congress (IOC). The British Ornithologists' Union already recognized the Accipitriformes, and has adopted the move of Falconiformes. The DNA-based proposal and the NACC and IOC classifications include the New World vultures in the Accipitriformes, while the SACC classifies the New World vultures as a separate order, the Cathartiformes. The latter view has been adopted here. The Accipitriformes are known from the Middle Eocene and typically have a sharply hooked beak with a soft cere housing the nostrils. Their wings are long and fairly broad, suitable for soaring flight, with the outer four to six primary feathers emarginated. They have strong legs and feet with raptorial claws and opposable hind claws. Almost all Accipitriformes are carnivorous, hunting by sight during the day or at twilight. They are exceptionally long-lived, and most have low reproductive rates. The young have a long, very fast-growing fledgling stage, followed by 3–8 weeks of nest care after first flight, and 1 to 3 years as sexually immature adults. The sexes have conspicuously different sizes and sometimes a female is more than twice as heavy as her mate. This sexual dimorphism is sometimes most extreme in specialized bird-eaters, such as the Accipiter hawks, and borders on nonexistent among the vultures. Monogamy is the general rule, although an alternative mate is often selected if one dies. ↑ Cramp 1980, pp. 3, 277. ↑ Ferguson-Lees & Christie 2001, p. 69. ↑ Christidis & Boles 2008, pp. 50–51. ↑ Hackett et al 2008. 1 2 Remsen, Cadena & Jaramillo Nores. ↑ Nores, Barker & Remsen 2011. 1 2 Chesser et al. 2010. ↑ Chesser et al. 2012. ↑ Gill & Donsker 2014. ↑ Dudley et al. 2006. ↑ Sangster et al. 26 Aug 2013. ↑ Hackett et al. 2008. Chesser, R. T.; Banks, R. C.; Barker, F. K.; Cicero, C.; Dunn, J. L.; Kratter, A. W.; Lovette, I. J.; Rasmussen, P. C.; Remsen, J. V., Jr.; Rising, J. D.; Stotz, D. F.; Winker, K. (2010). "Fifty-First Supplement to the American Ornithologists' Union Check-list of North American Birds" (PDF). The Auk. 127 (3): 726–744. doi:10.1525/auk.2010.127.3.726. Chesser, R. Terry; Banks, Richard C.; Barker, F. Keith; Cicero, Carla; Dunn, Jon L.; Kratter, Andrew W.; Lovette, Irby J.; Rasmussen, Pamela C.; Remsen, J. V.; Rising, James D.; Stotz, Douglas F.; Winker, Kevin (2012). "Fifty-Third Supplement to the American Ornithologists' Union Check-List of North American Birds". The Auk. 129 (3): 573–588. doi:10.1525/auk.2012.129.3.573. Full text via AOU, COPO, BioOne. Christidis, Les; Boles, Walter E. (2008). Systematics and Taxonomy of Australian Birds. CSIRO Publishing. ISBN 0-643-06511-3. Retrieved 2010-01-14. Includes a review of recent literature on the controversy. Dudley, S. P.; Gee, M.; Kehoe, C.; Melling, T. M. M. (2006). "The British List: A Checklist of Birds of Britain (7th edition)". Ibis. 148 (3): 526. doi:10.1111/j.1474-919X.2006.00603.x. Ferguson-Lees, James; Christie, David A. (2001). Raptors of the World. Illustrated by Kim Franklin, David Mead, and Philip Burton. Houghton Mifflin. ISBN 978-0-618-12762-7. Retrieved 2011-05-26. Gill, Frank; Donsker, D. "IOC World Bird List (version 2.4)". Worldbirdnames.org. Archived from the original on 24 March 2010. Retrieved 2010-03-12. Hackett, Shannon J.; Kimball, Rebecca T.; Reddy, Sushma; Bowie, Rauri C. K.; Braun, Edward L.; Braun, Michael J.; Chojnowski, Jena L.; Cox, W. Andrew; Han, Kin-Lan; Harshman, John; Huddleston, Christopher J.; Marks, Ben D.; Miglia, Kathleen J.; Moore, William S.; Sheldon, Frederick H.; Steadman, David W.; Witt, Christopher C.; Yuri, Tamaki (2008). "A phylogenomic study of birds reveals their evolutionary history". Science. 320 (5884): 1763–68. doi:10.1126/science.1157704. PMID 18583609. Nores, Manuel; Barker, Keith; Remsen, Van (July 2011). "Proposal (491) to South American Classification Committee: Change linear sequence of orders for Falconiformes, Psittaciformes, and Cariamiformes". Archived from the original on 2012-04-01. Retrieved 30 September 2014. Remsen, Van (November 2008). "Proposal (383) to South American Classification Committee: Separate Accipitriformes from Falconiformes". Archived from the original on 2010-06-28. Retrieved 30 September 2014. Remsen, J. V., Jr.; Cadena, C. D.; Jaramillo, A.; Nores, M.; Pacheco, J. F.; Robbins, M. B.; Schulenberg, T. S.; Stiles, F. G.; Stotz, D. F.; Zimmer, K. J. "A classification of the bird species of South America (section "ACCIPITRIDAE (HAWKS) 3" note 1)". Version 11 December 2008. American Ornithologists' Union. Retrieved 2010-05-26. Sangster, G.; Collinson, J. M.; Crochet, P. A.; Knox, A. G.; Parkin, D. T.; Votier, S. C. (2013). "Taxonomic recommendations for Western Palearctic birds: Ninth report". Ibis. 155 (4): 898. doi:10.1111/ibi.12091. Voous, K. H. (1973). "List of Recent Holarctic Bird Species Non-Passerines". Ibis. 115 (4): 612–638. doi:10.1111/j.1474-919X.1973.tb02004.x.